The Wood family ran two Temperance Hotels in Berwick for many years; the first was in West Street, and the second in Marygate. 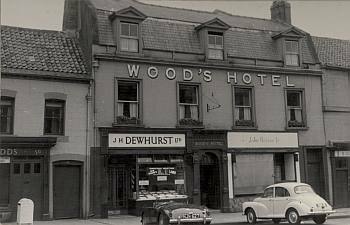 This photograph showing the Wood’s Hotel in Marygate, was taken in the 1950s. Photograph: Berwick Record Office – BRO 1250-93. The Wood family had its origins in Edinburgh, descendants of John Wood, joiner, who was active in the second half of the 18th Century. Amongst his many descendants he could number no less than four cabinet or furniture makers, and four generations of artists starting with his great-grandson Frank Wood. It was John Wood’s grandson, Robert, who first came to Berwick where he married a local girl, Elizabeth Stafford. Elizabeth died at the early age of 35 in 1860 leaving a young family. Of their six children the two eldest boys joined their father in the family cabinet making business, while the younger two branched out into hosiery and groceries. Left to care for his children Robert Wood soon married again, this time to an Edinburgh girl, Ann Watson. Ann lived very close to Robert’s place of birth in Edinburgh, and it is possible that the families were friends and that Robert had known Ann since she was a small child. Ann and Robert had a large family of nine children. They ran a Temperance Hotel firstly in West Street, Berwick and then in Marygate (Wood’s Hotel) for many years. This business was continued by some of their descendants into the 20th century. 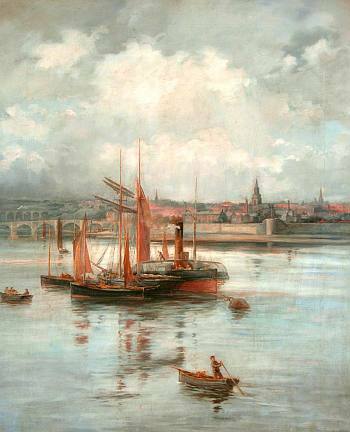 The ‘Susan’ with Fishing Boats, Berwick-upon-Tweed, Frank Wood, 1884. Photograph: © Berwick Museum and Art Gallery. Frank Watson Wood, named after his maternal grandfather, was the eldest child of Robert and Ann. Exactly when and how his artistic ability was discovered is uncertain. At the age of 13 he was apprenticed to a local grocer, but soon left to go to Berwick Art School. Having discovered his talent, James Wallace senior, the Art Master, encouraged him to consider art as a career. Presumably his family accepted the change in direction, particularly as the training he was receiving would enable him to make a respectable living as an art teacher. After completing his studies at Berwick, Frank Wood furthered his training at South Kensington Art School (later the Royal College of Art), and later at the Académie Julian in Paris. He was appointed second master at the School of Art in Newcastle in 1883, remaining there until 1889. He then moved to Hawick where he was Headmaster of the Art School. In 1899 he gave up teaching altogether and became a full-time professional artist, firstly at Southsea and later in Portsmouth, where he developed a talent for marine painting, and later in Berwick and Edinburgh. In 1903 Edward VII bought a view of Portsmouth Harbour, and this led to other Royal purchases. In 1918 he was fortunate to be present at the surrender of the German Fleet in Scapa Flow, and did some sketches of some of the ships before they were scuttled. He also accompanied George VI and Queen Elizabeth as official artist on their Royal Tour of Canada and the USA in 1939. His final years were spent in Perthshire where he died (at Dochfour, Strathyre) in 1953, at the age of 91. 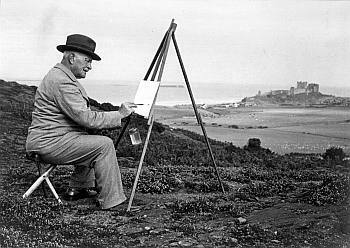 This picture of Frank Wood (1862 – 1953) was taken in his later years, showing him painting Bamburgh Castle from a vantage point on a nearby hillside. Photograph: Berwick Record Office – BRO 1752-1. Frank Wood is best known for his watercolours but he also did some work in oil. 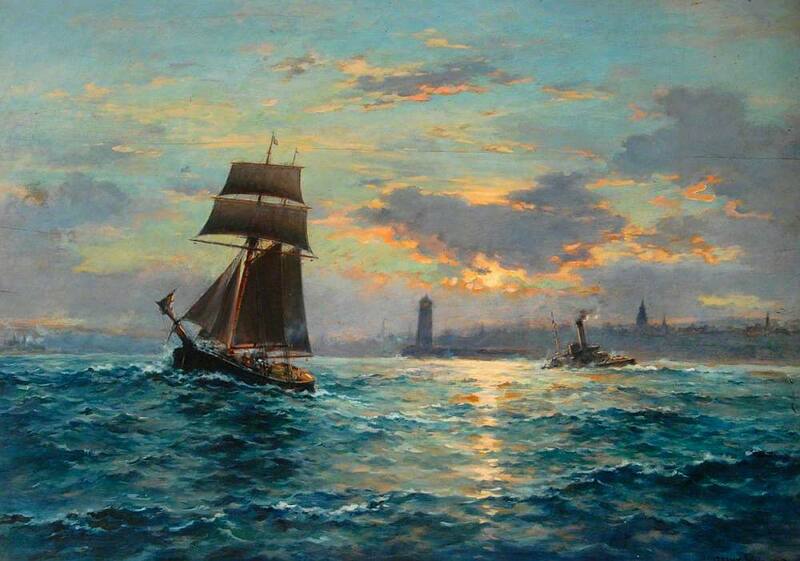 Locally he is remembered for his landscapes of Berwick and district, but he was also an accomplished portraitist and painter of marine subjects. He exhibited widely from 1889 onwards, with his work appearing regularly in the Royal Scottish Academy, The Royal Society of Watercolourists, The Laing Art Gallery and the Glasgow Institute of Fine Art. He exhibited once at the Royal Academy in 1902. His work is held in several public collections including the National Maritime Museum at Greenwich, London, as well as numerous private collections. He was a prolific artist throughout a long life. His early works were meticulously done with considerable detail. Later works became more fluid and accomplished, particularly those done in watercolour. Consciously or unconsciously he returned to favourite scenes throughout his life, faithfully recording the changes that took place in Berwick, as can be seen in the Marygate pictures of 1901 and 1946. He also painted historically significant scenes such as the view of the German Fleet in Scapa Flow in 1919, and his love of the sea can be seen in the numerous marine paintings featuring both local shipping and warships. A sizeable number of Frank Wood paintings are in the collection of Berwick Museum and Art Gallery. A great-nephew of Frank Wood, Arthur trained as an architect at Edinburgh College of Art and practised in Berwick for many years. 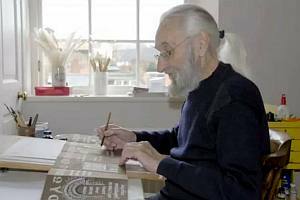 During the 1970s he and his wife, Jane, ran Spittal Pottery producing a wide range of useful and decorative wares. They had three children, Jonathan, Kitty and Jeremy. On retiring from his architectural practice, he was able to use his love of walking as an inspiration for paintings and sketches. With Berwick Ramblers,he published the illustrated walking guides Berwick Walks: Twenty-four Walks Within a Twelve Mile Radius of Berwick (2003) and A Walk Round Berwick Borough: Five Castles, a Palace and a Mountain (2006). He also undertook walking holidays in France and Spain and trekked in the Himalayas. Arthur Wood died in 2014. Berwick Museum and Art Gallery, [Family tree of the Wood family]. The Times, 24 March 1953, p. 10. F.W. Wood obituary. Berwick Advertiser, 5 July 2014. Arthur Wood obituary [online]. Sail and Steam at Berwick-upon-Tweed, Frank Wood, 1905. Photograph: © Berwick Museum and Art Gallery.